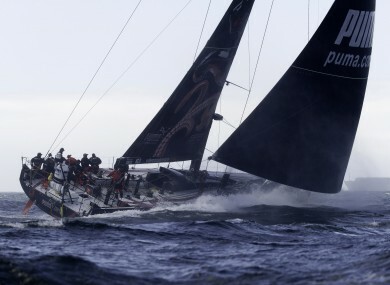 The PUMA racing team in action during leg two of the Volvo Ocean Race from Cape Town to Abu Dhabi. FIVE OF THE yachts in this year’s Volvo Ocean Race have been loaded onto an armed ship as part of a plan to avoid pirates operating in the Indian Ocean. Competitors reached an undisclosed safe haven in the Indian Ocean on Tuesday after organisers divided the second leg of the prestigious race into two parts for safety reasons. They are currently being transported to the northern Emirates before beginning a one-day sprint to the leg’s finish in Abu Dhabi. It is the first time that the 15-tonne yachts have been lifted onto a carrier in open water. The delicate operation, which took almost eight hours to complete, was deemed a success by race director Jack Lloyd afterwards. “The boats are built to be in the water, not in the air,’’ Telefónica skipper Iker Martínez said. Operations to load and unload a boat are tricky, particularly with these super-fragile boats and it does scare me a bit. However, the guys in the team are really good at this and we have absolute confidence in them. A similar procedure will be repeated during the third leg of the race from Abu Dhabi to Chinese city of Sanya. Telefónica currently lead the race on 61 points, with the Camper and Groupama teams in second and third. The race finishes in Galway next July. Email “Armed ship called in to protect Volvo Ocean Race from pirates”. Feedback on “Armed ship called in to protect Volvo Ocean Race from pirates”.